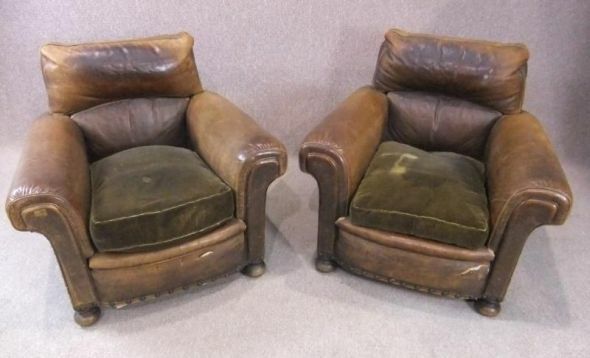 A magnificent pair of 1930s leather club chairs; with their beautiful worn leather look, the chairs still have their original velvet upholstered seats. Both chairs are in excellent condition for their age considering the amount of usage they would have experienced. The back, sides, and head rest have no rips or tears. But as you can see by the photographs, there are some small tears to the front centre of the chairs, but considering their age, this is very minor. To emphasise, these are ORIGINAL 1930s art deco leather armchairs, and not the new ‘distressed’ leather armchairs which are available at the moment. They have a timeless look that will never date. Please note, there is a slight tear to an arm of one of the armchairs. If you like our art deco leather armchairs, you will love our full range of antique furniture. Click here to view.